from the comfort of your own home…or wherever you are. Please use my Contact Page to inquire about available times for a free 30 minute phone consult to discuss your top health concerns and how we can work together to improve your health. I generally respond within 24 business hours. Click here to see my SERVICES. NOTE: If you have a medical condition that is not listed, feel free to fill out my contact form describing your specific needs and Tracey will determine if she can help you. All nutrition consulting sessions are via phone or video chat. Tracey is available for limited in-person sessions in Hendersonville, North Carolina. Please note that ALL appointments are scheduled in Eastern time. If we decide to work together, the next step is to fill out new client paperwork and schedule a 60 minute Initial Consultation appointment (see description and price below). As I guide you on your path toward health I will review your health history from the very beginning, what has worked and what has not worked, where you are today and what your goals are for the future. I will work with you to develop an individualized plan for eating and living well that works for your taste buds, your schedule and your life. Contact Tracey to schedule an appointment using the Contact Page. Fill out the Client Intake Form along with the Informed Consent, Policy and Waiver Form and email/mail these back to Tracey at least 2 days before your appointment. Note that the client intake form is very detailed and consists of 12 pages and includes both current and background information required to get to the root cause of your health issues. Prior to the appointment Tracey will review all recent labs (within last 6 months) that you may have provided along with a detailed review of your intake form. Discussion of health issues you are currently experiencing, your health history and more detailed discussion of other pertinent information provided on the intake form or from the lab review. Review your goals and expectations to determine how we can best work together to create your personalized plan. Appointment summary sheet with recommended next step(s), estimated length of time working together. If applicable, additional lab recommendations and costs will be provided. Three Diet and Lifestyle Packages to Choose From! Includes one 60 minute consultation and education session with Tracey followed by one 30 minute follow-up session at 2 or 4 weeks for a total of 90 minutes of direct contact time. Includes one 60 minute consultation and education session with Tracey followed by four 30 minute follow-up sessions over a 12 week period for a total of 180 minutes of direct contact time. Package 3 is identical to Package 2 except for one important aspect; this package increases the number of 30 minute follow-up sessions from 4 to 7 for a total of 270 minutes of direct contact time. Includes 300 minutes of contact time with Tracey over a time period of 4-6 months. This package will normally consist of one 60 minute consultation with eight 30 minute follow-up consultations distributed over the 4- 6 month period. This includes intensive lab interpretation, coordinated care with your physician if possible/needed, transitioning to a brain healing food plan along with lifestyle interventions to support optimization of brain function. This package includes time for Tracey to document your data, monitor your progress and communicate with your primary care physician (PCP) and/or neurologist. Package includes one detailed letter to your physician and/or neurologist (all additional letters are $50 each). Tracey is now offering a quarterly renewable plan for existing clients! Many of my clients appreciate regular contact to ask questions, ask for next steps in a wellness program, seek health advice, request a functional medicine or nutrition test with a review of results, get help in maintaining accountability or need a review of current supplements, as examples. This option is only for clients who have completed a nutritional consulting package with Tracey previously. You may sign up for the quarterly plan at any time, even if it is mid-quarter (Tracey will honor your included time and emails during the quarter). You will be billed for your requested plan on the 6th of the month in January, April, July, and Oct via Quick Books. At your last appointment each quarter Tracey will ask you if you wish to continue the quarterly plan. Tracey will reach out to you every 30-45 days, to schedule an appointment to meet via phone or video chat. If you end up needing additional appointment time with Tracey we can add on a la carte sessions on an as-needed basis. Unused appointment time or email communication does not roll over to the next quarter. If you prefer to pay-as-you-go rather than purchase a package you are welcome to use the a la carte options listed below. Please note you still will need to fill out the new client paperwork and waiver/consent form and complete the Introductory Appointment in order for Tracey to better understand your health history and provide you with quality care. Also, keep in mind that once you have completed a nutrition consulting package with me you may decide that you could benefit from continued support, motivation and troubleshooting. I’m happy to schedule one or more follow-up appointments with you and continue to support you on your path to health. Payment is required prior to all appointments. Payments can be made using an electronic check, through your checking account or with a credit card. Tracey can provide you with a superbill that you may be able to apply toward a health savings-type account. Telehealth and virtual appointments are not covered by insurance at this time. Methylation reviews of four key pathways; 1) Transsulferation, 2) Methionine to Homocysteine, 3) Folate, and, 4) Biopterin. SNPs can affect your ability to make the major methyl donor, SAMe and/or break down homocysteine, for example. Some SNPS affect your ability to make the major antioxidant glutathione. Detoxification is closely linked to methylation. SNPS related to the breakdown of estrogen, sulfites, glutamate and ROS (reactive oxygen species) will be reviewed. Nutrition-specific SNPs of importance include the APOE mutations that can increase risk of heart disease and Alzheimer’s, HFE mutations that increase risk of hemochromatosis and PON1 mutations that can affect your ability to detoxify pesticides where organic produce may be the best option for you. SNPs related to gut health and function will be reviewed such as FUT2 that impacts your mucosal lining, AGXT that affects your ability to degrade glyphosate and may make you more susceptible to yeast overgrowth and HLA SNPs that are linked to gluten intolerance/celiac disease. The analysis includes a personalized review and write-up of recommendations (this takes Tracey 2-3 hours), a 7+page summary and a 75-90 minute phone or virtual consult to discuss results, lifestyle and diet recommendations, any supplement recommendations, lab tests recommendations that may offer additional insight into your health concerns, and to answer your questions. Other relevant supportive material is included such as a list of nutrients to support SNPS, and ideas for sleep support, stress management, and how to avoid environmental estrogens. Tracey finds that the recommendations are greatly enhanced when clients also have a SpectraCell Micronutrient blood test to assess for nutrient deficiencies within the cell. This is optional, but is useful to guide your individualized care. See an example and cost of this test under Labs under the Work with Me tab. You will be provided with recommendations for foods to eat, lifestyle changes and other lab tests to consider and/or discuss with your doctor. Tracey can assist you with many recommended functional medicine labs or some clients opt to share their report from Tracey with their doctor for further advice or follow up. Dr. Jeffery Bland, PhD. and the father of Functional Medicine recently stated, “The future of healthcare is self care.” Learning about your genetics is one tool you can use to help guide your path toward health. A wonderful benefit of a nutrigenomics analysis is the ability to individualize diet, nutritional supplements and lifestyle recommendations tailored to you! The DNA testing is performed by a service such as Ancestry.com or 23andMe using a saliva sample. You order your own test kit and send in your saliva sample. See my Lab Testing page for information on DNA testing services. Due to a change in the current chip(V5) used by 23andMe, Tracey is now recommending Ancestry.com over 23andMe for your DNA testing service. Tracey can still evaluate 23andMe data, but the number of SNPs reported has been decreased. Once you receive you results contact Tracey. Depending on which site your use this can take from 4-6 weeks up to 3 months. . The kit will cost about $99, but sales are offered regularly and there may be a discount for purchasing multiple kits. You will upload your data to MTHFRsupport.com for $30 and share your login with Tracey. Tracey will provide you with instructions on how to do this, or find the instructions under client forms. Pay for the analysis with Tracey via check, your checking account or credit card (see price at the top of the page). Tracey will invoice you through Healthie or Quickbooks. Tracey provides you with an insurance superbill. Insurance will not cover a nutrigenomics analysis, but some clients report they are able to pay for this service using an HSA-type account. Schedule your appointment with Tracey. Right now we are booking out about 2 weeks once we receive your MTHFRsupport login and payment for appointments. Note: Tracey is also able to review your Stratagene report from Seeking Health. Send her a contact request for more information about this option. Nutrigenomics is a very useful tool in the health toolbox. It allows for individualizing and tailoring your health journey based on your unique genetics. Tracey is most happy to help you make sense of your genetics as related to nutrition and lifestyle. She is committed to continuing her Nutrigenomics education, setting aside 6-10 hours each week to study and remain as currant as possible with the ever new and emerging scientific information. Payment is due at the time the appointment is made prior to meeting via e-check, through your checking account or via credit card. Tracey will send you an invoice through Healthie or Quick Books. . I do not accept insurance or Medicare for nutrition consulting. Insurance companies will not accept billing for virtual appointments or Nutrigenomics Analyses. Good nutrition is a gift that keeps on giving! If you would like to purchase a gift certificate, contact me for details. To schedule an appointment, use my Contact Page. * Healthie messaging or email support is limited to brief answers to questions or clarifications. Please make a list of more in-depth questions for our follow-up visits. Package 1 is ideal for you if you are already following a healthy lifestyle, but need help formulating a plan for moving forward.During this four week period, Tracey will be your personal health coach and help guide you on your path to health. Having previously completed the review of your intake form and the required 45 minute Introductory Consultation, we will start this four week program by meeting for a full 60 minute session. Based on your unique needs we will work together to establish realistic goals that can be reached by making specific diet and lifestyle changes. You will implement the recommended changes for two to four weeks. After two to four weeks, you will then meet with Tracey again for a 30 minute follow-up session. During this time, we will review your progress and determine if the recommendations are working or if they need to be adjusted. During the four weeks Tracey will be available for support via Healthie messaging to answer brief questions and give you feedback on changes. If you need further follow-up sessions please see the pay-as-you-go a la carte options Tracey provides. Tracey is happy to assist you as needed. One-60 minute session which includes a detailed nutrition assessment and education, lifestyle and diet recommendations and support material. One-30 minute follow-up session at the two to four week period. Diet, lifestyle and supplement recommendations. Healthie messaging support and communication. * Supplement costs are not included in the package. I have been following the Paleo Diet for 6 months and am feeling really tired. Can you check how I am currently eating and see if I should do something different? I am following a diabetic diet to control my blood sugar, but I am having trouble with spikes that are slow to come down in the morning and after lunch. Can you help me adjust my food intake to better control my blood sugar? I am trying to gain weight during off-season for college baseball. Can you help me with an eating plan that would help me gain muscle and bulk up? Do you have dietary changes that might help my gout? * Healthie messaging support is limited to brief answers to questions or clarifications. Please make a list of more in-depth questions for our follow-up visit. Package 2 is your Diet and Lifestyle Transition option. It is ideal if you are just starting to adopt a healthier lifestyle and are fairly self-motivated. During this twelve week period, Tracey will be your personal health coach and help guide you on your path to health and make sure you stay on track. Having previously completed the review of your intake form and the required 45 minute Introductory Consultation, we will start this twelve week program by meeting for a full 60 minute session. We will use this time together to complete a nutrition assessment and begin your individualized program. Based on your unique needs we will work together to establish realistic goals that can be reached by making incremental diet and lifestyle changes. During this twelve week period, we will meet for four additional 30 minute follow-up sessions where we can discuss any needed modifications and build on your successes. If lab tests were performed, we will incorporate a review and interpretation of the results into the 30 minute follow-up sessions. If you have minor questions or would like to share updates in between sessions you can contact Tracey via Healthie messaging. At the end of the twelve week time period, if you need further follow-up sessions please see the pay-as-you-go options in the a la carte section. Tracey is happy to assist you as needed. Four-30 minute follow-up sessions over the next three months to help you make small, manageable steps toward positive change on your journey to health. Nutrient or other lab testing may be recommended. Follow-ups may be used to review lab data. * Lab testing fees and supplement costs are not included in the package. OPTIONAL: You may opt to include a Nutrigenomics Analysis and receive a $50 discount off the regular price. This is a special price offered to clients who purchase Packages 2 or 3. The regular price is $277. See the Nutrigenomics Analysis description below on my Health Coaching page. Note: all health coaching sessions are via phone or video chat through the Healthie platform providing secure, encrypted and HIPPA compliant interactions. Why can’t I lose these last 10 pounds? I have tried everything I can think of. Do you have some new ideas for me? I get frequent migraine headaches. I don’t know if the trigger is food or hormones or both. I think I have a food sensitivity. Can you help me get tested and manage my diet to help me with this pain? I am tired in the morning and too wound up to go to bed at night. Can you help me balance myself out? I don’t feel well, yet, my doctor says nothing is wrong with me. Can you help me get to the root of what is wrong? Could it be nutrition related? Can you help me with my painful foot and knee joints? I was an avid hiker and want to be back out hiking again! I was just diagnosed with ______________ (cancer, liver disease, diabetes, high cholesterol, rheumatoid arthritis, celiac disease, ect.). Can you help me find the right eating plan for me? Package 3 is identical to Package 2 except for one important aspect; this package increases the number of 30 minute follow-up sessions from 4 to 7. Many clients benefit from additional accountability and support. This package allows for frequent check-ins and more in-depth support. Are you someone who is sensitive to change or in a more fragile state of health requiring more gradual and careful changes? If so, please consider Package 3 as the better option for you. Seven-30 minute follow-up sessions over the next three months to help you make small, manageable steps toward positive change on your journey to health. Can you help me with a diet and lifestyle plan during and after my cancer treatment? I need help with my diet and exercise program. I am more likely to stick with my exercise program and new eating program with regular check-ins with you. I seem to have multiple food sensitivities, but I can’t seem to figure out what is causing my symptoms. I seem to react to everything. 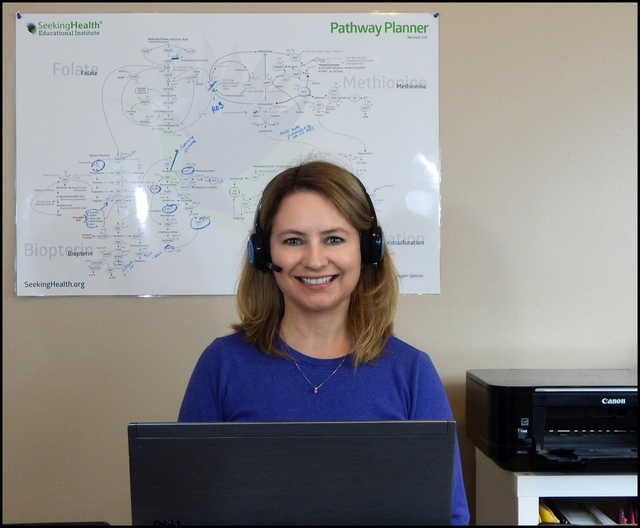 One-60 minute session which includes a detailed lab interpretation, nutrition assessment and education, lifestyle and diet recommendations and support materials to get you started on the Bredesen Protocol™. Eight-30 minute follow-up sessions over the next four to six months to help you implement the Bredesen Protocol™ and work toward improving your memory and cognition. Nutrient or other lab testing may be recommended. Follow-up sessions may be used to review lab data.